It’s been two years since the Syrian uprising led to the most violent of all the “Arab spring” revolutions. The ongoing bloodshed shows no sign of appeasement and Syria has reached an impasse. Any development in the situation implies so many political and religious consequences for the Syrians, as well as for the neighboring countries, that it jeopardizes the whole and fragile regional status quo. The deterioration of what is now a civil war into a sectarian conflict between opposing Shia and Sunni communities has spread to Lebanon and raises the specter of more confessional or sectarian unrest in Turkey and in Iraq. Turkey, Saudi Arabia, and Qatar took sides with the opposition, which is mainly Sunni, while Iran, Bagdad, and Hezbollah in Lebanon took sides with the Assad regime, which is supported essentially by the Shia/Alawite community, so that at the regional level, domestic and international politics alike are now affected by the Syrian war. Several studies have focused on its potential impact on Lebanon, Iraq, or Turkey, but none so far has given insight into Azerbaijan’s perceptions of it. The small but oil-rich Caucasian country offers an original and interesting point of view, as it is itself a mixed nation of Sunni and Shia communities. Azerbaijan is a close ally of Turkey, one of the key anti-Assad strongholds. Although to a lesser extent, as it is not an immediate neighbor to Syria, Azerbaijan is affected by the ongoing civil war. And the damage could be more substantial that we think for this long forsaken but strategically and energetically important country to the region, as well as to European and to US interests. What makes Azerbaijan so vulnerable about the so far war-torn Syria, is the religious turn the conflict is taking. With a population of 60% Shia and 40% Sunni, Azerbaijan is under the direct influence of both Iran and Turkey. Now, the regime is very concerned about the increasing confessionalization that has shaken the Middle East since the Arab springs because it might indirectly weigh on its own antagonistic communities and threaten its national stability. Azerbaijan has been independent for two decades, and over that period of time, it built neither strong political nor economic relations with Syria. On the regional geopolitical scene, they stood on different sides: Syria is a close ally of Russia and Armenia, because of a large Armenian diaspora in the country. Azerbaijan wishes to cut free from the Russian influence and is still at war with Armenia over the Karabakh territory and other occupied Azerbaijani lands. However, Azerbaijan and Syria established diplomatic bilateral relations as early as 1992. But it was not until May 2008 that Azerbaijan opened an embassy in Damascus. 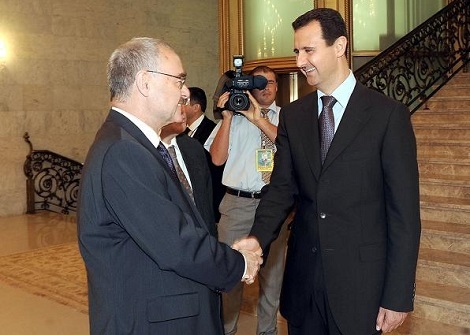 Bashar al-Assad visited Baku for the first time in July 2009 and signed in March 2010 a significant gas agreement, according to which Azerbaijan was to supply Syria with a 1.5 billion m3 of gas every year. Since the outbreak of the Arab spring revolutions, Baku is stranded in a political limbo. The regime shares a lot with the deposed despots of Tunisia, Libya, and Egypt, and even more with Assad’s Syria. Most post-Soviet autocratic regimes don’t feel secure from contagion and have taken exceptional and giveaway measures out of self-protection. In the suburbs of Baku, the statue of former Egyptian president Hosni Mubarak was removed and replaced by a more neutral monument. The comparison of the Azerbaijani regime with Syria is even more striking. Both Aliyev and Assad succeeded their father and turned the system into a dynastic autocracy. Azerbaijan had to back the Arab League decision to suspend Syria, but since the Arab spring began, Baku has remained cautiously silent. The escalation of violence in Syria between pro- and anti-Assad forces varies in inverse proportion to the deafening silence shown by Azerbaijan (and other regional and international powers). Baku cannot possibly and openly support the Syrian opposition, but repeatedly reproved Assad’s regime for the violent repression targeted at civilians. As a non-permanent UN Council member – since October 2011 and for the next couple of years – Azerbaijan has proven even more cautious. Overshadowed by both Iran and Turkey, it finds itself stuck between the two major pro- and anti- Assad supports in the region. However, Azerbaijan broke the silence and reacted strongly when in July 2012 Armenian authorities allowed Armenian refugees from Syria to settle in the Karabakh districts. The dispute over Karabakh and occupied territories by Armenian forces still fuels harsh criticism and Baku was loud in condemnation of this illegal and unacceptable settlement. Baku has apparently no interest in a change of regime in Damascus. It would prove the people are right and can overthrow an autocratic regime that shares strong similarities with Aliyev’s regime in Baku. A victory of the Syrian opposition cannot but encourage Azerbaijani opposition forces to undertake the same fight. On the other side, in terms of regional geopolitics, a regime change in Damascus, whatever comes afterwards, would benefit Baku in the sense that it would muffle Iran’s influence and reinforce ties with Turkey, without openly joining the coalition against Assad’s regime. Aliyev surely doesn’t want to shoot himself in the foot by supporting the Syrian opposition and give way to domestic social, political and economic claims. The Syrian crisis already sparked social protests in January 2013 in capital city as well as in several countryside cities, but they were repressed, and many were arrested and are still held in custody. The increasing and region wide Sunni and Shia split is a major threat to Azerbaijan’s national stability because of its unique and mixed Shia and Sunni religious identity. It’s the only Turkic-speaking state from the former Soviet empire to experience such a divide, inherited from history and geography—an obscure border zone between Ottoman and Safawid empires. Soviet systematic anti-religion repression had relatively successfully turned a traditional Muslim society into secular socialist citizens and laymen. The first independent republic of Azerbaijan (1918-1920) gave the illusion it had smoothed out all religious divides. By 1991, people who were confined in much smaller borders and were now deprived of their supranational Soviet identity were in quest of new one, both individual and collective. Religion became a powerful cultural and national identity marker. The spontaneous Islamic revival that followed was soon encouraged by foreign religious groups, originating among others from Turkey and Iran. Turkish proselytes both governmental (from the Diyanet on behalf of Ankara) and private (mostly Saït Nursi’s and Fethullah Gülen’s disciples, but also Suleyman Tunahan’s followers and Osman Nuri Topbas’s naqshibendis) indirectly challenged the Shia influence from some of Iran’s most popular ayatollahs and marja’al taqlid. Although it wasn’t an open competition, their influential efforts contributed to revive the national divide between the Sunni and Shia communities in Azerbaijan. The reestablishment of diplomatic bilateral relations between newly independent Azerbaijan and Iran favored the promotion and dissemination of official religious guidance from Ali Khamenei, the supreme guide of the Iranian Islamic revolution, since Khomeini’s death in 1989. Hundreds of Azerbaijani students moved to major Shia religious centers, like Qom and Meshhed, where they came in contact with influential religious thinkers. And in turn, they spread their word back home. Besides, other Sunni and more or less radical Salafi movements originating from the Arabic Peninsula developed and emerged on the religious scene of the Northern Caucasus and Northern Sunni regions of Azerbaijan, where they had never been before, and exacerbated the Sunni Shia divide. For national stability purposes, the Azerbaijani state has established a tight control over all religious groups through two institutions: the Muslim Board and the state Committee for Religious affairs, who are both in charge of promoting an official national Islamic faith and identity and for subduing to their authority (and to central power) all religious activists in the country. The religious situation was more or less under control until the Arab spring sparked in Syria and deteriorated into a Sunni against Shia civil war. Baku first succeeded in containing Iranian influence; and after 2010, they started to react to Turkish influence as well. Official religious cooperation with Ankara decreased. The central mosque on the Martyrs’ place, which was a landmark of Turkish religious influence in the country, was officially closed for security reasons, but the true motive behind the closure did not lure anyone. Baku’s reaction to whatever form of foreign influence indicates how concerned they are about gaining their control back over their own destiny and keeping the secular harmony between their communities so as to ensure national integrity. But the Syrian crisis weighs on the nation’s religious quarrels. One may object that only a non-significant minority of pious Muslims and religious figures are genuinely concerned and involved, while the vast majority of the secularized population looks at Syria more with curiosity than solidarity because it is focused on its own survival. It is undeniable that the Azerbaijanis are traditionally little informed nor interested in what’s happening in the Middle East. However, religious leaders, activists, and disciples follow Syrian updates with great interest because they resonate on the Azerbaijani religious scene. The traditionally very discreet Salafi community and social network, which is itself divided on this issue among others, kept its distance. The Salafi leader and prosecuted imam since 2008, Gamet Suleymanov, hardly ever mentions Syria in his preaches. But, if they don’t speak out publicly, individuals do in private and support jihad forces in Syria. Reports of Caucasian jihadists, from Northern Caucasian ethnic groups like Lezgins, Udins, Avars, and Chechens, have been made. Those were involved in Afghanistan before, but their actual number in Syria and their story is hard to trace. As for Shia activists, they are much more open about the Syrian crisis: openly supporting the Assad regime against the opposition and its foreign advocates. The most charismatic Shia leader in Azerbaijan is Hadji Ilgar Ibrahimoglu, who we interviewed in his office of the DEVAMM human rights association. He clearly does not believe in the democratic and revolutionary aspirations of the Syrian opposition to Assad and blames foreign intelligence. “What is happening in Syria is not a people revolution against a tyrant—although Assad is one—but a plot formed by the United States and Israel to overthrow the regime of Bashar al-Assad; and doing so, the objective is to get rid of Iran’s major ally in the region” . (It is worth mentioning that there is truth in what he says, with the U.S. providing assistance to the armed rebel forces and the CIA coordinating the flow of arms from Saudi Arabia and Qatar to the rebels.) On the one hand, he ignores the Syrians’ democratic claims, and on the other, he’s among the first religious men in Azerbaijan to blame Aliyev’s regime for autocratic practices. When questioned about his paradoxical attitude, he dodges the issue and gives a pure religious reading of the situation. The leaders of another influential Shia association working “for the promotion of moral purity”, Manevi Safliga Devet Ijtimai Birligi, Elshan Guliev and Elshan Mustafaoglu, took a similar stand: “behind the support to the rebels are foreign powers that are hostile to Iran and to Shia and who want to punish the Syrian regime for being pro-Iran”. They added: “There is no such thing as Western democratic intentions, nor for Syria, nor for any other Arab country; the West proved totally indifferent to the Shia uprising in Bahrein”. And for many Shia in Azerbaijan, “the United States and their Sunni friends allied against Iran only to weaken Ahmadinejad’s regime”. Their reaction in solidarity with Assad’s regime has actually few religious motivations. Both schools differ very much in terms of religious fundamentals, and all attempts at including Alawis in the greater Twelfth Imam Shia failed, but they both praise Ali, and that’s pretty much where the comparison ends. The Alawis of Syria do not recognize the authority of any marja’al taqlid, whether from Iran or Iraq, and remain loyal to their ancestral syncretic practice, known as ghulat or “excessive” by all other Shia schools. Although they were under Russian and Soviet rule for a long time, Azerbaijani Shia recognize the authority of Shia leaders of Iraq and Iran. Whereas many Azerbaijani Shia students stayed in the Shia district of Sayyida Zaynab in Damascus, and many pilgrims visit the place, they haven’t bond with the Syrian Alawis, nor did they seek to learn more about their particular practice. Their affinity with the Alawis is not to be found in religion. They are pro-Assad by default. They are well aware the man is a tyrant, but the feeling that Arab spring revolutions will favor the Muslim Brotherhood is extremely pervasive in the Shia community. In parallel, they believe that the Assad’s regime is the last and only bulwark against the dangerous thriving of radical Salafi movements all across the region. But, there are other hidden and probably more important reasons behind their support for Assad, like their strong identification with Shia Iranian organizations. With the exception of the illegal and marginal Islamic Party of Azerbaijan, Azerbaijani Shia organizations cannot display open solidarity with Iran, but in reality they do, as they all follow the guidance of great religious thinkers. In Azerbaijan, the most popular marja’ al taqlid are Ali Khamenei, Ali Sistani, Jaffar Subhani, Javad Makarrami, Fazil Lenkerani (deceased in 2007), and Jevad Tabrizi (deceased in 2006). With the exception of Ali Sistani, all are Iranians and based in Iran, and young Azerbaijani leaders like Haji Ilgar or Elshan Mustafaoglu were educated in Iran and remain close to the position of Iran’s greatest figures and for more political reasons than religious affinity with Syria’s Alawis. The Syrian war is a serious concern for the regime in Baku. Beyond the Sunni Shia split, the secular opposition forces view the Arab spring revolutions as a source of inspiration. A recent poll shows that only 35 percent of the Azerbaijani believe the country is going in the right direction, against 34 percent who wish for a revolution on the example of what happened in Northern Africa, 14 percent who are disgruntled but favor the status quo and stability, and 17 percent who do not give an opinion, probably because they fear chaos in a Syria-like scenario, as shown by official media propaganda and reports. Moreover, the interest shown by religious leaders and communities for the confessionalization of the conflict in Syria is one more concern for Azerbaijani central authorities, who fear for national integrity and stability as it stresses antagonisms in the community. At the same time, a regime change in Damascus would be disastrous for Baku. The war and chaos in Syria legitimates (or at least helps) the autocratic regime in Azerbaijan, like other dictatorial regimes of the former Soviet Union and shows that strong power only guarantees peace and national cohesion, especially in multicultural and multi religious contexts. On the other side, a regime change in Damascus would stress Russian and Iranian diplomatic failures and indirectly pave the way for the emerging of Azerbaijan as a regional power. Of two evils, Azerbaijan has to choose the least. While Baku is weighing the pros and cons for its sole national interests, like we all do, Syrian civilians continue to fall under the harsh repression of their democratic aspirations. Interview with Religious attaché in Turkey’s embassy in Azerbaijan, Bakou, December 2012. Interveiw with Ilgar Ibrahimoglu, Baku, Dec 2012. Interview with Elshan Guliev and Elshan Mustafaoglu. Interview with Kenan Rovshanoglu, Bakou, 21 December 2012.